My latest story is a 12,000 word paranormal romantic comedy called Dead Boyfriends. 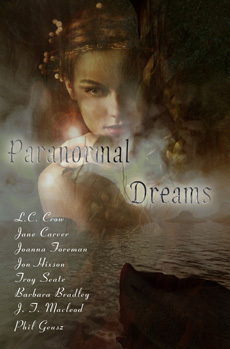 It appears in the Melange Books anthology, Paranormal Dreams. Hope you will check it out. “I’m in too much emotional pain,” Daisy explained to her best friend, Jemma, that evening over her third huge glass of Pinot Noir. The presence of Pinot Noir, and pairs of what were most likely Prada shoes scattered haphazardly across the parquet floor of Jemma’s open-plan Soho apartment, were oddly reassuring. For once Daisy didn’t envy her friend her wealth and beauty. Or the breasts that entered a room before she did without the aid of silicone. “That’s an interesting way of putting it.” Jemma curled her feet under the hem of her chic white bathrobe with its discreet Harrods logo embroidered on the breast pocket. No, Daisy chided herself, don’t think “breast”, it’ll only make you envious. She was too sad to be envious. “Were you going to dump him?” Jemma sparkled when it came to matters of relationship difficulty. She adored the drama. “It was an accident,” Daisy whinged. An accident? Edward Carver’s balcony had a spectacular fourth-floor view of Canary Wharf. The balcony railing was shoulder high. So it would have taken a spectacularly strange set of circumstances to lead to Daisy’s latest boyfriend to necking himself with a length of computer cable. The cable had been looped around Andrew’s neck, the balcony rail, and in turn wound several times around the leg of the massive mahogany desk in Carver’s office. The cable was fibre optic, with tough plastic sheathing. So it would have taken a chain saw to cut it. Her previous boyfriend, Derek Le’Maistre, had drowned in a puddle barely six inches deep. He’d been drunk at the time, certainly. But one would think that falling face first into a pool created by a missing paving stone in Daisy’s garden would have shocked him awake. She’d only discovered the body the next morning. Evidently he’d been staggering around in the dark, to besiege Daisy’s house and profess his undying love for her, when he must have tripped and fallen.